Created by former Facebook product designer Andy Chung, Pattern is a simple, focused drawing application for early stage design and ideation. When it comes to creating a design project, getting ideas onto the page or screen quickly is easier said than done. It's all too easy to get slowed down by preparing physical materials, or find yourself sidetracked by fancy Photoshop brushes when working on a computer. To help creatives get drawing quicker and with ease, former Facebook product designer Andy Chung has launched Pattern for the iPad and iPad Pro. Having lead the design of Facebook's Reaction buttons (the quirky alternatives to the standard thumbs up 'Like' icon), Chung has used his experience to create a drawing application tailored to the needs of early stage designs and ideations. Taking its inspiration from physical products such as technical notebooks, Pattern is a back to basics app that focusses on simplicity and functionality. Gone are the fancy brushes and effects that slow down the early creative process; instead, Pattern makes use of gestural controls and the Apple Pencil. 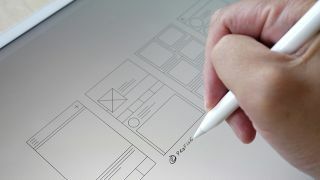 Pinching the screen makes shapes in seconds, and users can switch between manual control and the Apple Pencil seamlessly to create freehand drawings. Pattern's speed doesn't compromise its accuracy though, as the application makes use of an adjustable dot grid pattern. Continuous auto-saving, multitasking support, and the ability to export to your inbox finish off Pattern's list off features. While it isn't designed to replace desktop software down the line, Chung hopes that Pattern will go some way to replacing notebooks and stacks of paper filled with design ideas. Available now from iTunes at just $2.99, could Pattern bring designers closer to a paperless office?